The explosive history of lithium ion batteries. And the future may be, too, if we don’t change things. Beware the Samsung Galaxy Note 7. Photo illustration by Slate. Images by kraphix/Thinkstock and Samsung. Samsung’s massive global recall of its Galaxy Note 7 smartphone has once again focused attention on the hazards of lithium ion batteries—specifically, the hazards of lithium ion batteries exploding. Samsung first announced the recall on Sept. 2, and just a week later it took the extraordinary step of asking customers to immediately power down the phones and exchange them for replacements. 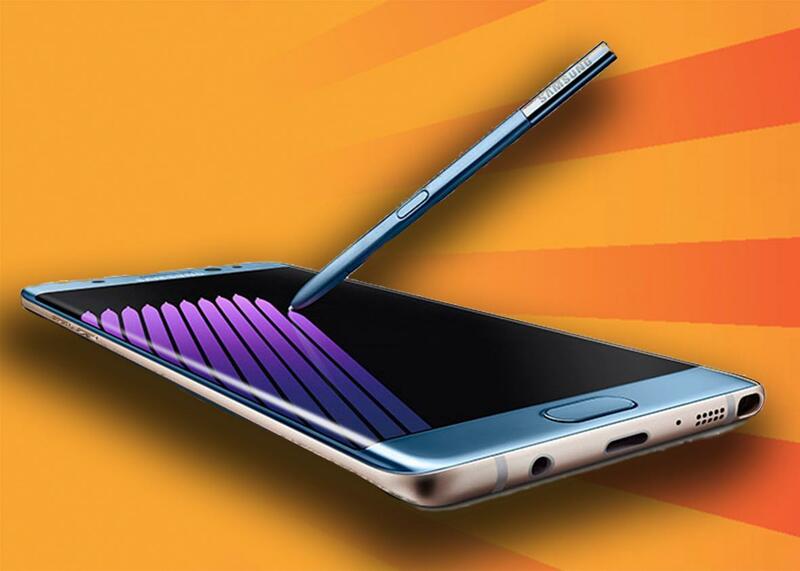 The Federal Aviation Administration issued a strong advisory asking passengers not to use the Note 7 or even stow it in checked baggage. Airlines around the world hastened to ban in-flight use and charging of the device. Lithium rechargeable batteries are ubiquitous and, thankfully, the vast majority work just fine. They are industry’s favored power source for wireless applications owing to their very long run times. They are used in everything from power tools to e-cigarettes to Apple’s new wireless earbuds. And most of the time, consumers take them for granted. In a way, this battery is the ultimate technological black box. Most are bundled into applications and are not generally available for retail sale. Accordingly, the technology is largely out of sight and out of mind, and it does not get the credit it deserves as an enabler of the mobile computing revolution. Indeed, the lithium rechargeable battery is as important as the miniaturized microprocessor in this regard. It may one day change the face of automobile transport as a power source for electric vehicles. So it is impossible to imagine modern life without lithium ion power. But society has taken a calculated risk in proliferating it. Scientists, engineers, and corporate planners long ago made a Faustian bargain with chemistry when they created this technology, whose origins date to the mid-1970s. Some variants use highly energetic but very volatile materials that require carefully engineered control systems. Generally, these systems work as intended. Sometimes, though, the lithium genie gets out of the bottle, with potentially catastrophic consequences. This happens more frequently than you might think. Since the late 1990s and early 2000s, there has been a drum roll of product safety warnings and recalls of lithium rechargeables that have burned or blown up practically every kind of wireless application, including cameras, notebooks, hoverboards, vaporizers, and now smartphones. More ominously, lithium batteries have burned in commercial jet aircraft, a likely factor in at least one major fatal crash, an incident that prompted the FAA to issue a recommendation restricting their bulk carriage on passenger flights in 2010. In early 2016, the International Civil Aviation Organization banned outright the shipment of lithium ion batteries as cargo on passenger aircraft. And so the Galaxy Note 7 fiasco is not just a story of how Samsung botched the rollout of its latest weapon in the smartphone wars. It’s a story about the nature of innovation in the postindustrial era, one that highlights the unintended consequences of the information technology revolution and globalization over the last 30 years. In essence, the difference between a handy lithium battery and an incendiary one can be boiled down to three things: how industry manufactures these devices, how it integrates them into the applications they power, and how users treat their battery-containing appliances. When a lithium rechargeable discharges, lithium ions layered onto the negative electrode or anode (typically made of graphite) lose electrons, which go into an external circuit to do useful work. The ions then migrate through a conductive material known as an electrolyte (usually an organic solvent) and become lodged in spaces in the positive electrode or cathode, a layered oxide structure. There are a variety of lithium battery chemistries, and some are more stable than others. Some, like lithium cobalt oxide, a common formula in consumer electronics, are very flammable. When such variants do ignite, the result is a blaze that can be difficult to extinguish owing to the battery’s self-contained supply of oxidant. To ensure that such tetchy mixtures remain under control, battery manufacturing requires exacting quality control. Sony learned this lesson when it pioneered lithium rechargeable battery technology in the late 1980s. At first, the chemical process the company used to make the cathode material (lithium cobalt oxide) produced a very fine powder, the granules of which had a high surface area. That increased the risk of fire, so Sony had to invent a process to coarsen the particles. An additional complication is that lithium ion batteries have many failure modes. Recharging too fast or too much can cause lithium ions to plate out unevenly on the anode, creating growths called dendrites that may bridge the electrodes and cause a short circuit. Short circuits may also be induced by physically damaging a battery, or improperly disposing of it, or simply putting it into a pocket containing metal coins. Heat, whether internal or ambient, can cause the flammable electrolyte to generate gases that may react uncontrollably with other battery materials. This is called thermal runaway and is virtually impossible to stop once initiated. So lithium ion batteries must be equipped with numerous safety features, including current interrupters and gas vent mechanisms. The most basic such feature is the separator, a polymer membrane that prevents the electrodes from contacting each other and creating a short circuit that would direct energy into the electrolyte. Separators also inhibit dendrites, while offering minimal resistance to ionic transport. In short, the separator is the last line of defense against thermal runaway. Some larger multicell batteries, including the types used in electric vehicles, isolate individual cells to contain failures and employ elaborate and costly cooling and thermal management systems. Some authorities ascribe Samsung’s battery crisis to issues with separators. Samsung officials seemed to hint that this might be the case when they indicated that a manufacturing flaw had led the negative and positive electrodes to contact each other. Whether the separator is actually at fault is not yet known. At any rate, it is revealing that for Samsung, the problem is entirely the battery, not the smartphone. The implication is that better quality control will solve the problem. No doubt it would help. But the manufacturing of commodity electronics is too complex for there to be an easy solution here. There has long been an organizational, cultural, and intellectual gulf between those who create batteries and those who create electronics, inhibiting manufacturers from thinking of applications and batteries as holistic systems. This estrangement has been further accentuated by the offshoring and outsourcing of industrial research, development, and manufacturing, a consequence of the competitive pressures of globalization. The result has been a protracted consumer product safety crisis. In the late 1990s and early 2000s, notebook designers introduced faster processors that generated more heat and required more power. The simplest and cheapest way for designers of lithium cells to meet this demand was to thin out separators to make room for more reactive material, creating thermal management problems and narrowed margins of safety. Economic pressures further eroded these margins. During the 1990s, the rechargeable lithium battery sector became a highly competitive, low-margin industry dominated by a few firms based mainly in Japan. From around 2000, these companies began to move manufacturing to South Korea and China in operations initially plagued by extensive bugs and high cell scrap rates. All of these factors played a role in the notebook battery fire crisis of 2006. Numerous incidents prompted the largest recalls in consumer electronics history to that date, involving some 9.6 million batteries made by Sony. The company ascribed the problem to faulty manufacturing that had contaminated cells with microscopic shards of metal. Establishing quality control will be a tall order as long as original equipment manufacturers disperse supply chains and outsource production. Another problem is that makers of applications like notebooks and smartphones may not necessarily know how to properly integrate outsourced lithium cells into safe battery packs and applications. Sony hinted as much during the 2006 crisis. While admitting its quality control woes, the company suggested that some notebook manufacturers were improperly charging its batteries, noting that battery configuration, thermal management, and charging protocols varied across the industry. My analysis of U.S. Consumer Product Safety Commission recalls at that time (to be published in Technology & Culture in January 2017) suggests that there may have been some truth to this. Nearly half of the recalled batteries (4.2 million) in 2006 were for notebooks made by Dell, a company whose business model was based on integrating cheap outsourced parts and minimizing in-house R&D costs. In August 2006, the New York Times cited a former Dell employee who claimed the PC maker had suppressed hundreds of incidents of catastrophic battery failures dating to 2002. In contrast, relatively few reported incidents at that time involved Sony batteries in Sony computers. In a sense, then, the lithium ion battery fires are largely a consequence of how we have structured our society. We still don’t have uniform safety protocols for a wide variety of problems relating to lithium ion batteries, including transporting and disposing of them and safely rescuing passengers from accidents involving electric cars powered by them. Such measures badly trail the drive to seek greater convenience, and profit, in electronics and electric automobiles. The quest for more power and higher voltage is straining the physical limits of lithium ion batteries, and there are few technologies less forgiving of the chaotically single-minded way in which human beings are increasingly making their way in the world. Scientists are working on safer alternatives, but we should expect many more unpleasant surprises from the existing technology in the interim.